BUENOS AIRES, Dec 30 2012 (IPS) - A programme launched in Buenos Aires three years ago to encourage the use of bicycles has already brought results: the use of this environment-friendly means of transport has increased fivefold in the Argentine capital. 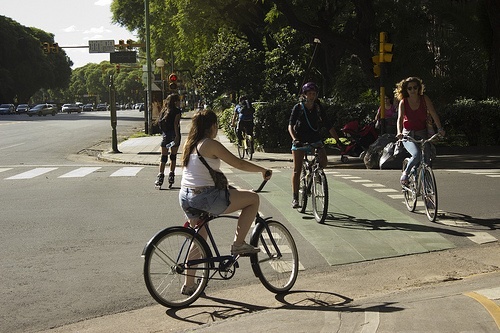 “Buenos Aires, mejor en bici” (Buenos Aires, Better by Bike) is the name of the project that emerged in 2009 in the Healthy Mobility Office of the Transport Subscretariat of the Argentine capital, with the aim of extending protected bike lanes in the city. “When we started to work on the idea of making bicycles an alternative means of transportation here, they only accounted for 0.4 percent of all trips. That has now gone up to two percent,” the director of Healthy Mobility, Paula Bisiau, told IPS. To achieve this, work was carried out on three fronts: the creation of a network of bike lanes; the establishment of a free, public bicycle sharing system; and a campaign to encourage bicycle use. “Buenos Aires is flat; the climate, except for the occasional rainy day, is mild; there are many students and people who practice sports…this was a city that could become very bicycle-friendly,” the official explained. In a survey carried out by the government of centre-right Mayor Mauricio Macri, 61 percent of respondents said they were prepared to use the bicycle as a means of transport, as long as they could ride in safe bike lanes. A total of 95 km of two-way bike lanes have been built on the left shoulder of roads that are free of bus traffic, set off by a raised yellow concrete curb. The public bicycle sharing service was later put into effect, with three stations and 50 bicycles. Users can borrow bikes for an hour, after leaving their address and identification card number. Today there are 28 stations, 1,000 bicycles and 60,000 registered users, who generally use the service to commute to and from work or school, according to the Healthy Mobility Office. With the growing affluence in Buenos Aires, traffic lights for cyclists have been installed, to make traffic safer, and special green lanes have been created for bicycles to cross at intersections, alongside the pedestrian lanes. The programme’s goal is to reach 100 stations and 2,000 bicycles in the free bike hire system, and 130 km of bike lanes by the end of 2013. To finance this new means of transport, the state-owned Banco Ciudad launched a line of soft loans for bicycle purchases, payable in up to four years, with fixed rates. Bisiau explained that, besides the creation of infrastructure, the government is working on promoting a “cultural change” with the help, for example, of students from the public University of Buenos Aires. In an industrial design class, students worked on a prototype of a bicycle that could be used to carry merchandise. And apparel design students came up with proposals for garments for cyclists. The Healthy Mobility Office offers talks in schools, gives courses to taxi drivers about cyclists, and added a chapter of rules on bicycles to the driver’s license test. To make the programme more visible, guarded bike parking facilities are set up during public and private events that draw large numbers of people, like concerts or open-air conferences, and an effort is being made to get companies involved as well. A total of 130 agreements have been signed so far with companies interested in fomenting the use of bicycles among their employees. The businesses assume a commitment to provide a bicycle parking space, bicycles, and in some cases, showers. Andrés Fingeret, country director for the Institute for Transportation and Development Policy (ITDP), said the Buenos Aires programme had brought about a change: that people no longer see bicycles merely as a form of weekend fun and recreation. “Today there is a real community of bike riders who use the bicycle as their first choice of transport. And there are even clubs of cyclists who get together to go on rides,” he commented to IPS. He said that when riders discover that there is a safe network of routes, or that they are able to try out the free bike-sharing system, demand immediately goes up. Fingeret recommended moving towards “greater integration” between bicycles and the rest of the transportation system, to further bolster their use. He suggested, for example, making it easier for people to take bikes on trains, building ramps in train stations with stairs, or fomenting the opening of new bicycle stores and centres that offer services and accessories for cyclists. Buenos Aires has thus joined the global trend towards a more sustainable, clean means of transportation, in which Mexico City and Rio de Janeiro clearly stand out in Latin America. Fingeret agreed that a cultural change is taking place. “Traditionally, people who used bicycles to get about were so poor that they couldn’t even afford a motorcycle. Today, the bicycle has taken on status and there is a broad segment of society, especially among people under 40, who are actively choosing it,” he said.